"Facing mounting coastal threats, the US Marine Corps is developing new methods and mindsets to face its foes and remain relevant, as Michael Fabey reports: After years of fighting on land in Iraq, the US Marine Corps (USMC) has returned to its naval roots only to find its traditional method of conducting amphibious warfare being challenged in a way modern marines have never before faced. Squaring off against the kind of peer competition that the service has not experienced since the Cold War, the USMC is formulating a new way of conducting combat operations in the littorals while still maintaining its traditional operational skillset. One of the most promising amphibious warfare concepts being explored and developed by the USMC involves expeditionary advance bases (EABs). The concept, new to the US marines, turns traditional marine basing on its head. Instead of relying on the full-frontal assault and seizure that can be mounted by a traditional amphibious readiness group (ARG) with fixed bases, under the EAB concept small, mobile operations bases would be established inside the attack arc of an adversary. be inherently resilient; invert cost imposition; buy time for other operations; and create enemy uncertainty. Additionally, EABs would get critical marine infrastructure and vulnerable capabilities ‘off the X’, as the USMC would say, which simply means creating a smaller, more mobile force that is much harder for enemy forces to target than a traditional base. Marines could employ trucks, barges, ferries, and other non-traditional vehicles to provide the necessary mobility as well as better mission support continuity. An EAB is designed to provide the essential functions of a traditional base but with a less vulnerable, more resilient support infrastructure. Always playing catchup: "...“We have to embark a fifth-generation MAGTF on a fourth-generation ship,” he said...."
"WASHINGTON — The Marine general in charge of the Navy’s expeditionary warfare programs said his mission was not just “reinvigorating expeditionary warfare,” but to get Marines “back to naval warfighting” after two decades of primarily land combat. Addressing a forum at the Hudson Institute, Coffman, director of expeditionary warfare on the Navy staff, said: “We need a next-generation expeditionary warfare that can operate across the range of military operations.” That means the ability to “fight tonight, fight tomorrow,” across all domains, combatant commands and the full range of military operations. “Our goal is to reinvigorate naval expeditionary forces” to meet the “enduring need for power projection,” which will require the ability to gain sea control by new means including the historic Marine mission of seizing and defending expeditionary advanced bases, he said. …Coffman also complained that inadequate command and control technology on the older amphibs, particularly the big decks, prevents the embarked Marine Air-Ground Task Forces (MAGTFs) from taking full advantage of its capabilities, such as the F-35B strike fighter with its fifth-generation sensors and data processing capabilities. “We have to embark a fifth-generation MAGTF on a fourth-generation ship,” he said. Due to the growing threat that Russia, China and maybe Iran could use long-range defenses to keep naval expeditionary forces away from a crisis zone, Coffman said there were considerations of putting more defensive and offensive weapons on the amphibs and the Marines employing their own long-range weapons from the ships or from expeditionary bases to help in the sea control fight. He did not provide any details." An F-35B Lightning II jet performs a vertical landing during a field carrier landing practice at Ie Shima Island, Okinawa, Japan, Dec. 5, 2018. The F-35B landed, refueled and took off for the first time at Ie Shima Island. The F-35B belongs to Marine Fighter Attack Squadron 121, Marine Aircraft Group 12, 1st Marine Aircraft Wing. The FCLP prepares the F-35B pilots for situations faced while deployed on aircraft carriers. Pilots land within the same restrictions they would when landing on an aircraft carrier. An F-35B landing at Ie Shima Island demonstrates the air warfighting capability, operational flexibility and tactical supremacy that this platform brings to the Indo-Pacific region, our allies and our partners. (U.S. Marine Corps photo by Lance Cpl. Alexia Lythos) https://cdn.dvidshub.net/media/thumbs/p ... 0w_q95.jpg "
Marines with Marine Heavy Helicopter Squadron 465, 1st Marine Aircraft Wing, refuel and resupply an F-35B Lightning II jet with Marine Fighter Attack Squadron 121, 1st MAW, during Distributed STOVL Operations (DSO) on Ie Shima island, Japan, Jan. 23, 2019. The rehearsal enabled CH-53E helicopters to re-fuel and re-arm F-35B Lightning II jets from a Forward Arming and Refueling Point (FARP), significantly improving the operational flexibility, survivability, and lethality of the F-35B. The FARP provided a hot refuel and hot reload for multiple aircraft with All Up Rounds (AUR), also known as a completely assembled weapon, giving pilots the ability to stay in the fight longer, and accomplish more missions in a shorter period of time from austere locations. (U.S. Marine Corps video by Cpl. Dakota Heathwarr)"
It appears in the first few days of a shooting war in Westpac that the USMC F-35B force will be the most survivable TACAIR asset in the theatre. Hope they have the numbers to hold the air till China expends its ballistic missile force and their air bases are reduced to rubble by massed cruise missile strikes from SSGNs and strategic bombers. "The Marines' F-35B Joint Strike Fighter achieved another first in recent weeks during an at-sea deployment when the aircraft conducted training strikes with an external ordnance load. ...Officials said this was the first time the F-35B executed strikes in the region with ordnance fully loaded...."
2LD: What were the advantages to operate the Rafale from the Charles de Gaulle? Lt. Gen. Desclaux: Basically, in the AOR, whether the Rafale was air or navy, it was conducting the same type of mission; 70 percent dynamic targeting, and 30 percent deliberate targeting. Obviously the advantage of being on an aircraft carrier is you’re closer from the theater of operation. The disadvantage when you take off from a French carrier is that your Rafale brings less ammunition than when taking off from a runway. For example, with the Rafale from land, you can take off with two cruise missiles, as from the carrier it’s only one. The air force Rafale can take off from the land with six 250 kilos bombs – from the carrier, it only was four. You’re closer but you bring less ammunitions and you need gas anyway because in the dynamic targeting operation loiter time is important to mission success. Thanks for that refreshing quote with URL 'popcorn'. spazsinbad wrote: :shock: Thanks for that refreshing quote with URL 'popcorn'. As it returns from its first combat deployment, the Marines' version of the F-35 is no longer a baby-faced boot. "We overall supported more than 50 days of combat flying for over 1,200 flight hours," Shoop told Task & Purpose. "We supported both Operation Freedom's Sentinel up in the Afghanistan region as well as Operation Inherent Resolve over Syria/Iraq. We employed ordnance in both theaters on numerous days," Shoop said. "Every single one of the pilots employed ordnance in theater. So, we were very busy..."
Now that the Russians have read Marine press-releases and found out that F-35s were in the theater, I am sure they will publish reports of all the dogfights Su-35s won against them. The Marine Corps' F-35B Joint Strike Fighters led a big part of the campaign to demolish Islamic State terrorists in recent months, outpacing the combat flight hours flown by older aircraft on past deployments by 2-to-1. 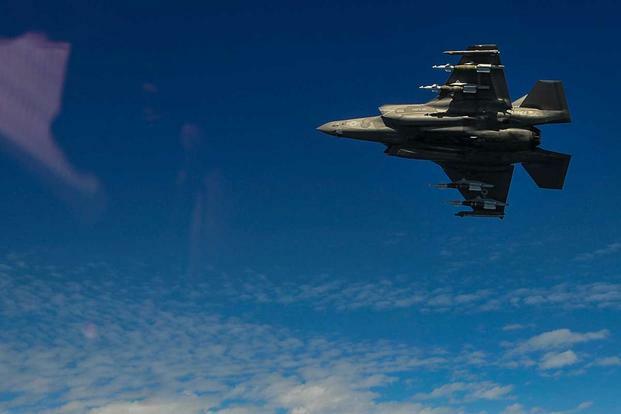 Members of Marine Fighter Attack Squadron 211 flew 1,200 combat hours over Iraq and Syria, "making up a considerable portion of the ordnance that was dropping in theater," said Col. Chandler Nelms, commander of the 13th Marine Expeditionary Unit. "They were very active and did very well," he told Military.com. "As the MEU commander, anytime I see aircraft flying that much, I get concerned about what the breaking point is going to be. But there's no breaking point with these guys; they just crushed it." The Marines spent more than seven months deployed to the Pacific and Middle East. The F-35B detachment was assigned to the 13th MEU, which operated from aboard the amphibious assault ship Essex. It was the first time the Marine Corps' variant of the stealth jet, which can take off and land vertically, deployed to the Middle East. The F-35B's first combat strike was in Afghanistan in September, where the Marine pilots were flying close-air support missions, said Lt. Col. Kyle Shoop, VMFA-211's commanding officer. From there, they flew more than 50 days' worth of close-air support and defensive counter-air missions in Iraq and Syria. "Every day, [the pilots] were supporting over six hours of time in theater," Shoop said. The Marines were prepared for a higher-level fight had they been provoked by other actors in the region, he added. Their encounters with pilots from Russia, which is supporting Syrian President Bashar al-Assad's forces, were minimal though, he said. "We were aware they were airborne," Shoop said. "There are some established de-conflictions that are already set up between Russian and U.S. forces. They were all adhered to, but we were aware." The F-35Bs were able to give troops on the ground more information than would have been possible in the AV-8B Harrier jump jet, which the Joint Strike Fighter will eventually replace. Its sensors are better in poor weather, Shoop said. The Marines ended up flying the F-35B about twice as much as the Harrier flew on past deployments, Nelms said. "A conservative estimate is the F-35 flew 100 percent more hours on this deployment than a typical deployment for a Harrier squadron," he said. "When you consider that their readiness was 75 percent or better ... while doubling the amount of flight hours being flown, it's a real testament to the aircraft and the maintainers." The F-35B pilots weren't the only members of the MEU supporting the fight against ISIS. A CH-53E Super Stallion heavy-lift helicopter provided airlift in Iraq, Nelms said, and an artillery battery deployed to Syria with M777 howitzers. "It was an exciting time to be doing so many different things," he said. The MEU is expected to return to California this week. "F-35Bs flew more than 100 combat sorties against the Taliban and ISIS while deployed aboard the amphibious assault ship USS Essex, said Lt. Col. Kyle Shoop, commander of Marine Fighter Attack Squadron 211." "During its deployment, the F-35B squadron flew close air support missions over both Afghanistan and Syria, Shoop said. In Syria, the aircraft also helped assess the damage done by coalition airstrikes in bad weather because the F-35's radar is far better than the F/A-18 Hornets' sensors." "When you consider that their readiness was 75 percent or better ... while doubling the amount of flight hours being flown, it's a real testament to the aircraft and the maintainers."